Super Eagles midfielder Oghenekaro Etebo was remarkable as his side settled for a goalless draw, his impressive performance against Sheffield Wednesday in Saturday’s English Championship cracker has earned him rave review from Steve Bruce. Etebo joined the Potters last June before joining Nigeria at the 2018 Fifa World Cup in Russia and he has already settled himself in the club having played 27 games so far in the second-level division with just a goal to his belt. The 23-year-old’s superb display was insufficient for Stoke City to secure their eleventh win of the campaign – as both teams settled out for a goalless draw – however, the Owls manager was awed by the qualities of the former Las Palmas player. “Where did Stoke find Peter Etebo?,” Bruce asked a reporter after the game. 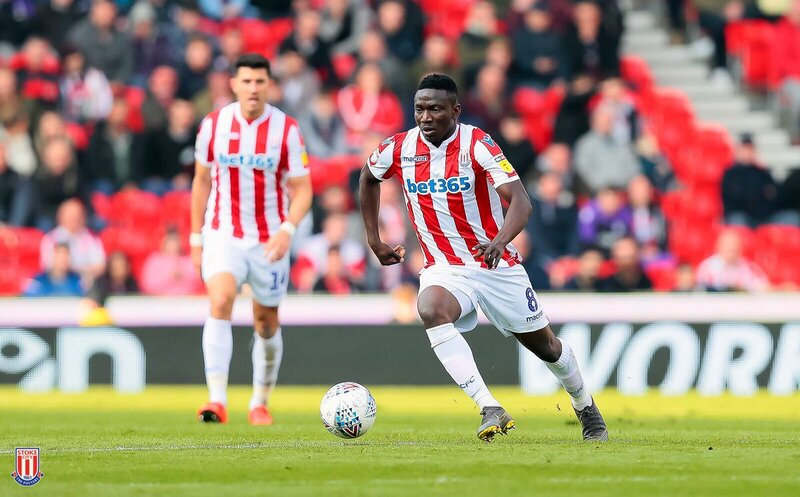 Saturday’s stalemate left them fourteenth in the table with 48 points from 39 matches, be that as it may, Etebo delivered a star turn in the middle of Stoke City midfield alongside Joe Allen as he proceeded with his good run of form and superb performances under Nathan Jones. The combative midfielder has charged the team to maintain the fighting spirit as the season-ending draws closer. Great performance, let’s keep this same fighting spirit lads,” Etebo tweeted.